Marty Makar (second from left), principal of Osborn Middle School, accepts an award for her work supporting STEM education at her school from Jon Benton, an architect at Orcutt/Winslow, Dr. Beverly Hurley, director of academic alliances in GCU’s Strategic Educational Alliances, and Patty Tate, superintendent of the Osborn School District. An image of Yoda, the “Star Wars” Jedi master, is superimposed next to the smiling face of Osborn Middle School Principal Marty Makar on her school’s website. 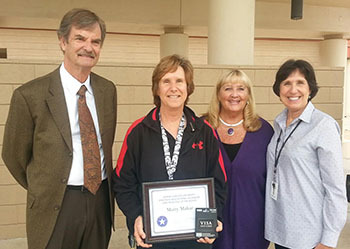 But it’s not Makar’s love of science fiction, it’s her achievements in providing additional science, technology, engineering and mathematics (STEM) studies to her students that garnered her the October award as Grand Canyon University’s principal of the month. Arizona school superintendents so far have nominated more than 30 principals who have created STEM opportunities and go above and beyond to encourage children to participate and understand the role of these subjects as they approach college and their future, said Dr. Beverly Hurley, SEA’s academic alliances director. “We want to recognize some of the outstanding things happening in our schools, especially schools excelling in the STEM area,” Hurley said, noting it’s a natural fit with GCU’s emphasis on STEM. One of the opportunities Makar, whose Phoenix school is in the Osborn School District, made available to her students was taking Osborn’s outdoor adventure club to the Salt River to test water samples and conduct other science experiments. 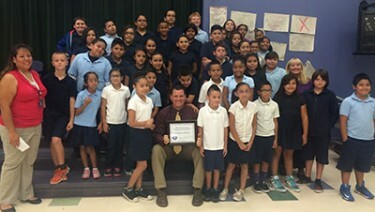 Flanked by his students at Sun Canyon Elementary in Phoenix is principal Jonathan Rohloff, who received the principal of the month award for September from GCU. The September honoree was Jonathan Rohloff, principal of Sun Canyon Elementary in the Fowler Elementary District. Among Rohloff’s STEM contributions were helping create an after-school STEM club and supporting activities that enabled students to create and launch hot air balloons and study robotics. Rohloff also is a strong advocate for the school’s science fair. GCU honored both principals at surprise gatherings, Hurley said, and each received a $500 honorarium to be used to meet their school’s needs. The funds were donated by the Orcutt|Winslow architectural firm, a longtime education advocate in the Valley. The principals also received big baskets of purple Lopes swag. Makar donated the honorarium to her school’s Point of Pride store, where students can trade in orange cards they earn for good behavior for goods and supplies. “Many of the kids save up points to buy Thanksgiving dinners for their families” or Christmas gifts for their siblings, Hurley said. GCU is inviting honorees to a Feb. 18 men’s basketball game in the Arena, where they will be recognized, Hurley said.